History does not repeat itself, but it often rhymes — words sometimes reputed to have been said by Mark Twain. Even if he did not say this, he should have done. Since the industrial revolution, the world economy has experienced two great waves of economic integration or, as we now call it, “globalisation”: in the late 19th and early 20th centuries and the late 20th and early 21st centuries. Conflict among great powers, economic depression, nationalism and protectionism killed the first. The same combination, if in a different historical sequence, might yet kill the second. Last time, the ruin started with the first world war. The great depression and soaring protection came later. This time, the rot seems to have begun with the great recession, after the 2008 crash. Protection and rising tension between great powers — the US and China, in this case — followed. But both stories are rooted in the same reality: the difficulty of maintaining an open world economy. History may rhyme, but it has not repeated. By ignoring the advice of foolish reactionaries, policymakers managed the recent recession vastly better than their predecessors did the depression of the 1930s. Instead of a collapse in output and trade, this era has seen no more than a setback. Some of it was even desirable, notably the decline in irresponsible cross-border short-term lending. The growth of trade has slowed in relation to world output but not collapsed. Nevertheless, the pressures on globalisation are real (see charts). What explains the slowdown in the growth of trade? The weakness of investment in the post-crisis period is one factor. Another is the exhaustion of opportunities for the unbundling of global supply chains in goods (the distribution of parts of integrated production processes across countries). Instead, we see evidence of “re-shoring” (the transfer back of production into the original country) of some supply chains as the cost advantages of producing in emerging countries decline. Also significant has been the import of some supply chains into China (the transfer of production processes from other countries) a point brought out in a recent report from the McKinsey Global Institute. The last significant liberalisations of trade were the completion of the Uruguay Round in 1994 and China’s accession to the World Trade Organization in 2001. Since then, the Doha round of multilateral trade negotiations flopped, Donald Trump withdrew the US from the Trans-Pacific Partnership and negotiation of a Transatlantic Trade and Investment Partnership between the US and EU has barely got off the ground. More recently, the world has witnessed a shift towards outright protectionism. Mr Trump has used a controversial national security argument to justify tariffs on imports of steel and aluminium, including those from the country’s closest allies. These actions violate WTO rules, which define the national security loophole very restrictively. Most importantly, the US has launched an open-ended trade war on China. The total affected trade already comes to about 7 per cent of US imports. In addition, the US has indicated its desire to upend the WTO’s dispute settlement process and is blocking appointments to the organisation’s appellate body, with a view to rendering it unable to function. If the actions taken so far are not hugely damaging, far more so is the ideological rejection of core principles of the global trading system by its founder, the US: instead of liberalisation, there is protectionism; instead of multilateralism, unilateralism; instead of global rules, national discretion. What is not clear is how far this represents a permanent US repudiation of past commitments. But suspicion of Chinese aspirations and a belief that trade has been “unfair” to the US are shared across US politics. What lies ahead? Much depends on the evolution of domestic politics in high-income countries, especially the US. If allegedly perfidious foreigners continue to be made a scapegoat for failures of domestic policy — always a temptation — an inward-looking economic nationalism might become even more potent. Alternatively, in a world of resurgent great power politics, we might see protectionist trading blocs emerge around the economic superpowers: the US, the EU and China. The evolution of economic opportunities Will also shape globalisation, as it always has, from the steamships and cables of the 19th century to the container ships and internet of today. In a seminal book, out in early 2019, Richard Baldwin of the Graduate Institute in Geneva discusses what he calls “globotics” — an ugly neologism that describes the integration of artificial intelligence with robotics. The author argues that this is about to do to many services what the old information revolution did to manufacturing: facilitate offshoring and destroy enormous numbers of jobs. The impact will be two-fold. First, improvements in technology will make it far easier to collaborate at a distance. People who are not physically present will be able to participate much more fully in collaborative work, principally as a result of improvements in virtual reality. This will promote globalisation. Second, many tasks now carried out by people will be done by AI and robots, revolutionising many service activities, with profound and highly destabilising economic and social effects. The development of cross-border economic activities will continue to reflect the interaction between technology and politics. The former creates opportunities, the latter struggles to manage them. Politics, now, are increasingly inward looking. Yet humanity is discovering new ways of annihilating distance and jumping barriers. In the long run, the latter will probably win and globalisation proceed. But the short run looks very bumpy. In a world where “nobody knows anything,” investors may be no better than film-studio moguls at predicting the future. If so, then markets, instead of being predictive, become increasingly reactive, simply extrapolating recent events. LONDON – If there is one useful conclusion that economists and investors can draw from the crazy year that has just ended – indeed, from the whole crazy decade since the Global Financial Crisis of 2008 – it is this: As they say in Hollywood, “Nobody knows anything.” In the film industry, the richest and most experienced studios and producers spend vast amounts of time and money on audience research, but still have no idea if their latest creations will turn out to be hits or flops. So why be surprised if the same is true of financial markets – or, for that matter, of commodity prices, policymaking, and corporate performance? The main cause for concern has been the behavior of financial markets. Many economists saw the simultaneous plunge in long-term interest rates and equity prices in December as an indicator of recession: either investors “know something” awful that is not yet evident in the statistics, or declining market sentiment would become a self-fulfilling prophecy by causing businesses or consumers to cut back. But, before concluding that financial markets can always predict or shape the future, we should recall that economic and policy changes usually move financial expectations – not vice versa. In October, with political risks receding, emerging markets started to outperform, stock markets stabilized elsewhere (even in Europe), the oil price returned to what looked like a stable pre-sanctions range of $60-65, and the strengthening of the dollar ended. In short, markets seemed to move broadly in line with the changing political and macroeconomic fundamentals – until everything suddenly went haywire in early December. 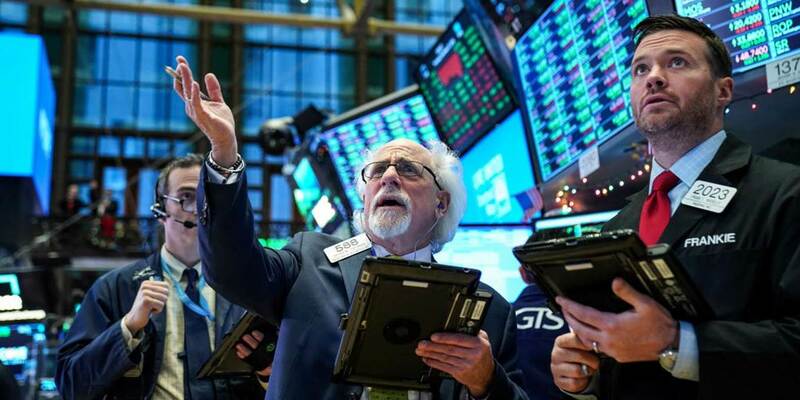 For the next three weeks, until December 24, the S&P 500 collapsed by 16% for no apparent reason, Brent oil plunged from $61 to $50, the dollar again strengthened, and yields on ten-year US bonds fell from 3% to 2.7%. When China slowed sharply in 2015, debt-ridden state-owned enterprises and property developers needed a bailout. The government turned to cash-rich households for help. Now China is slowing again: Growth in 2018 was just 6.6% according to official figures, the slowest in 28 years. This time around, SOEs and real estate look better, while households and private companies are struggling. That will shape Beijing’s policy response, and probably disappoint investors hoping for a 2009- or 2015-style lending splurge. The roots of the current downturn can be found in the response to the last one. By 2015, years of overinvestment had pushed housing inventories sky-high and state-owned steel and cement margins through the floor. 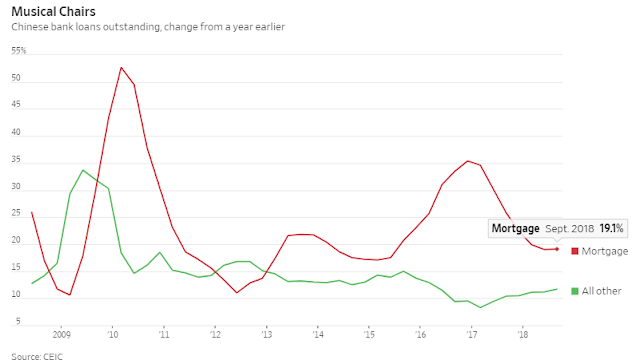 To solve the problem, Beijing gave banks the green-light to ramp up mortgage lending—helping property developers run down inventory and goosing construction, in turn pushing SOE steel and cement margins back higher. Mortgage loans outstanding, growing at 17% in early 2015, were rising 35% on the year by the end of 2016. Over the same period, growth in all other bank credit outstanding slowed to 9.5% from 14%. The widely hailed “deleveraging” in 2016 and 2017 was more of a debt reshuffling. This all worked a little too well: Housing prices in China are still rising at 10% on the year. But households are much more indebted. 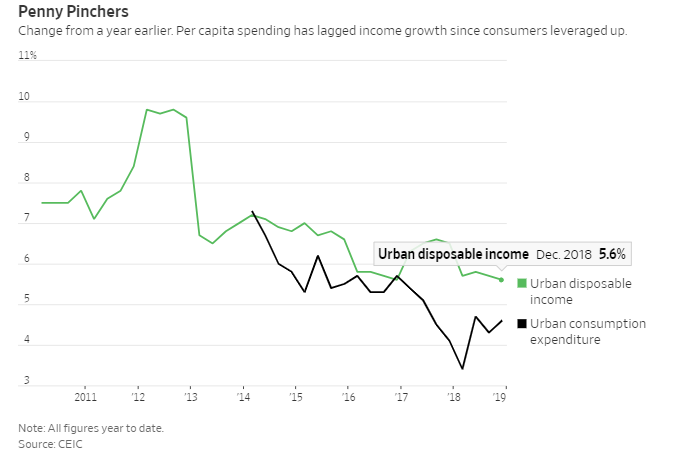 Consumer spending isn’t collapsing—real per capita urban disposable income for 2018 was up 6.5% on the year, against 6.6% in the first quarter, and per capita expenditures actually accelerated. But consumers facing high interest payments probably are belt-tightening now as the labor market deteriorates. Debt payments knocked nearly 2 percentage points off nominal, effective urban income growth in the third quarter, according to Gavekal Dragonomics. Western companies selling premium products such as Apple, which in early January blamed its revenue guidance cut on slowing growth in China, have begun to feel the chill. All of this means another big lending splurge looks counterproductive, since it will just mean higher mortgage payments. Beijing is likely to focus on shoring up income growth and purchasing power instead. Further tax cuts are likely. Some quiet relaxation of strictures on shadow financing, to help cash-strapped private employers, is also in the cards. And to shore up investment, policy makers will likely focus on infrastructure rather than housing, funded by heavy provincial government debt issuance. Unfortunately for commodities investors, that isn’t really a recipe for a 2016 style rally, because infrastructure is usually less metal intensive than residential construction. If and when housing prices start drooping and state-owned industrial companies start defaulting, Beijing may have to pull out the big credit-stimulus gun again. In the meantime, investors will have to be satisfied with a softer touch.